This kitchen has a trendy look with contrast of White and Dark cabinets. 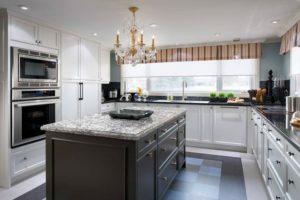 Both countertops are Quartz and are the perfect complement for the respective cabinets. The black accents on the White cabinets and Gold accents with the Dark paired with the stainless steel appliances are the perfect combination to complete the look of this kitchen. Stop in our showroom and get some great ideas for your next kitchen or bathroom remodeling project.